Reviewed by Maria Conway on November 8, 2016 8:44 am . Get ready to jump for joy because JackpotJoy Bingo is about to change your online gaming experience! JackpotJoy isn’t your typical online bingo site; it’s well known for being one of the trailblazers in the online bingo gaming industry, with a lot of big winners and life-changing jackpots coming from the site on a daily basis. 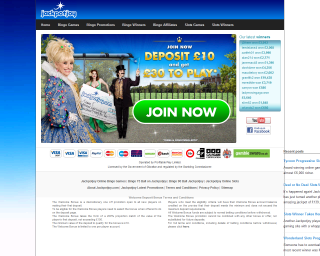 The site is one of the most well-marketed and prominently advertised bingo brands around, with Barbara Windsor as their resident Bingo Queen appearing in all of their ads. JackpotJoy was launched in the year 2000 and has since become one of the premier destinations for all-around gaming, with a huge fan base to match. The site made a change in software platform to GameSys in early 2010 and with it came new offers, promos and a better gaming interface. The homepage has a simple royal blue and white color scheme, making it easy on the eye without the mass of flashy or mismatched themes in your way. The site is more than just a traditional bingo site. Games load very fast and overall gameplay is smooth, fun and clear. As expected from a software like GameSys, the site was made perfectly for any potential member, male or female. The site is completely clutter-free and easy to navigate so players will be able to find the game they’re looking for with ease. In the unlikely event that you do, JackpotJoy has a customer support team that’s ready to come to your rescue anytime. JackpotJoy and the Bingo Queen welcome all newly registered players with a generous 200% bonus on all first deposits of up to £200. This bonus is an excellent way for new players to get involved with the site and encourages instant gameplay. Furthermore, ticket prices fall between 1p and 50p, giving players the opportunity to get a lot of gaming out of their bonus cash. JackpotJoy stays on top of the game by constantly coming up with innovative bingo and instant win games, along with a limitless supply of promotions and bonuses. The bingo variations are a really special treat for any bingo fan, with a good balance of 75-ball and 90-ball bingo games. If you want to try your luck for a progressive jackpot, JackpotJoy has a variety of progressives to choose from, such as the 75-ball bingo progressive jackpot in the Lounge room; and the 90-ball bingo progressives found in the Sapphire and Emerald rooms. Ticket prices vary, ranging from 5p to 25p. Players will also enjoy unique and fun twists to the age-old classic game with JackpotJoy’s collection of special bingo games such as Bejeweled Bingo, Speed Bingo, Bingo Royale, Super Snap!, and the £15,000 Winter Wonderland Game, among others. There are also bingo bonus games on offer in many rooms. Random players will see an extra side game pop-up at the end of a regular bingo game that will result in them winning a certain amount of bonus cash to play with. You can also team up with your bingo buddies for the Family Fortunes themed team bingo. These games have some of the biggest payouts around so you better not miss it. It’s not surprising that JackpotJoy is one amongst the top online bingo sites around, especially when the site has life-changing jackpots on offer. Everyday, the site has a £500 jackpot full house free bingo game and a £2,000 Super Jackpot every night. If you’re looking for higher payouts, make sure you won’t miss Super Jackpot every Sunday and you might just win the £30,000 jackpot. There’s no reason for you to miss out on your favourite games while you’re away from home because you can play a number of JackpotJoy bingo games on your mobile phone such as Full House Bingo, Deal or No Deal slots, Diamond Bonanza, BlackJack Mobile, Treasure Island and Roulette Splendide. JackpotJoy offers more than bingo with their collection of games that will keep their members thoroughly entertained. There are heaps of top-quality classic slots and multi-line slots, many of which give players the chance to walk away with a generous progressive jackpot. JackpotJoy has a long list of classic slots such as Bullion Bonanza, Tycoons Progressive, Tycoon’s Slots, High Five, Winning Streak, Yeah Baby! and American Dream. If you prefer multi-line slots then you better try out Peggle, Jungle Jump!, Houdini, Wonderland, Fortune Temple, Double Bubble, Tiki Island, Chuzzle Slots, Diamond Bonanza, and many more. The site also has an impressive selection of casino games, instant win games and video poker for players to enjoy and win huge progressive jackpots. Some of the casino games include Roulette Splendide, Atlantic City Blackjack, Three-Card Poker, Red or Black? Hi Lo, Jacks or Better, Baccarat, Deuces Wild and Play Your Cards Right, just to name a few. For fans of video poker, there’s Aces and Faces, Jacks or Better Progressive, Deuces or Better, Double Bonus, Tens or Better, Ultimate Video Poker and many more. Players can also enjoy instant win games such as Wonderland Instant, Jalapeno Racers Pinata Party, Fortune Temple, Golden Balls, Bejeweled Hypercash, Fortune Teller Keno, Crazy Fruits, Moolah Machine, and a whole lot more. The list is seemingly endless, and JackpotJoy regularly adds new games into their list. Make sure you check out the New Games tab so you won’t miss out on anything. Share the love for JackpotJoy by recommending the site to your friends! If a friend decides to join and becomes an active player, you’ll be entitled to a £10 refer-a-friend bonus. So the more friends you invite, the more cash you’ll earn. JackpotJoy also has an excellent loyalty scheme. Each time a member plays at JackpotJoy, they’ll be earning Joy Points. The points can be converted to bonus cash, and can also be used to enter prize draws with a wide range of special gifts such as gadgets and gizmos. The more Joy Points you earn, the faster you’ll climb up the VIP ladder. VIP players will gain access to exclusive promotions and bonuses, luxury gifts and prizes, special cashback and bigger reload bonuses, as well as invitations to 5-star events and holidays. JackpotJoy follows strict privacy and safety policies to help keep their members’ data and banking transactions fully-protected and secure. All information submitted by users is encrypted using SSL encryption. JackpotJoy is licensed by the Government of Gibraltar and regulated by the Gibraltar Gambling Commissioner.